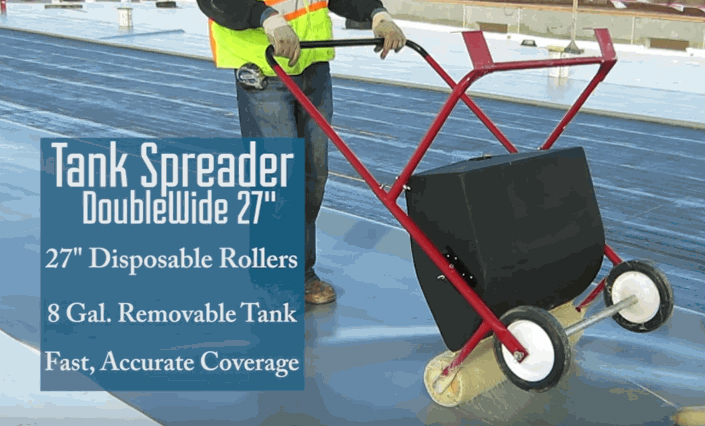 All spreaders are gravity-fed and have disposable rollers. All parts are disposable or simple to replace. 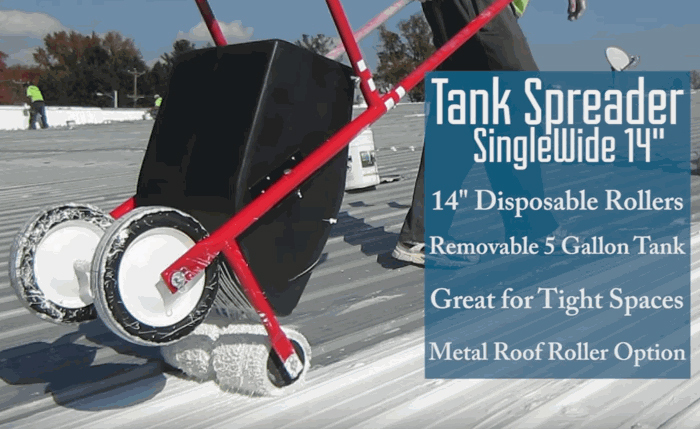 Tank Spreaders apply any pourable material such as low VOC adhesives and coatings from a tank. 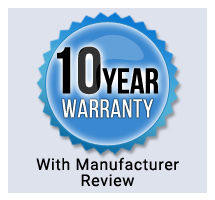 Singlewide 14", Doublewide 27", Super 40"
Distribution ports can be increased with a drill bit. It is best to open the holes in increments of 1/16? at a time and usually only the center most holes. The 14? 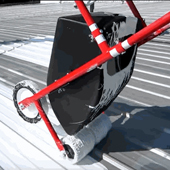 Singlewide is best for roofs under 100 squares and in cut up areas with penetrations. The 27? 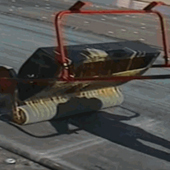 Doublewide is a good balance of maneuverability and productivity. Ususally used on projects from 50 squares to 500 squares. The 40? 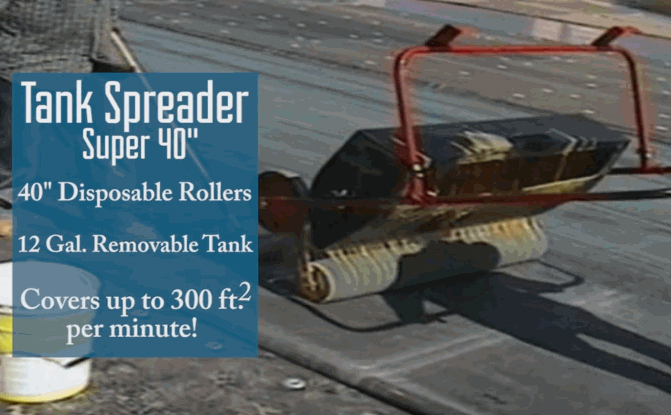 Superwide Tank Spreader offers unmatched productivity. As the operator walks along a 40? 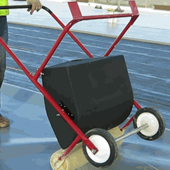 (1 Meter) swath of material is applied. Why are the wheels covered in tape? 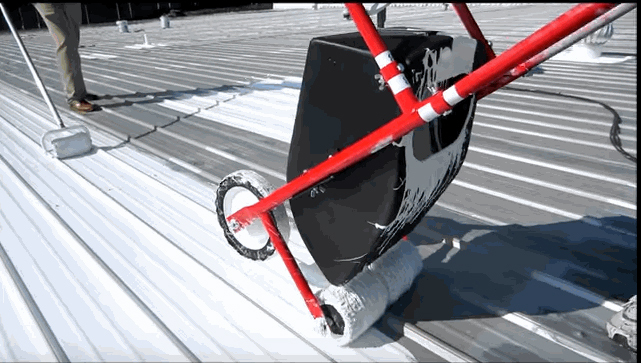 Teflon tape on the wheels protects them from glue and coatings. 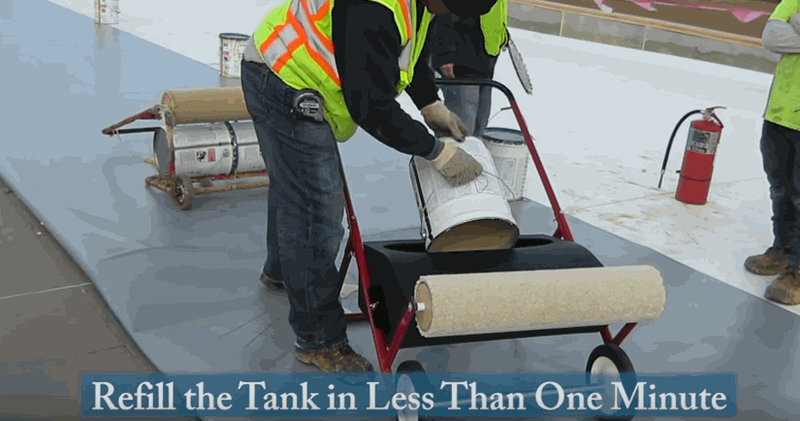 Why are there two screws at the end of the holes in the tank? These two holes are optional. 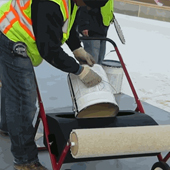 They are to be used when applying Bonding Adhesive where no running puddle is needed. 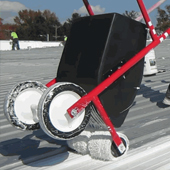 When applying coating it is helpful if the end holes are closed to allow the running puddle to diminish toward the ends of the roller. 3. Flammable liquids as the fuel. Using flammable liquids is extremely dangerous. Anyone handling and/or using them, must be properly trained to do so. Proper grounding will prevent a static electric spark and eliminate this as a cause of fire. You must ground the BetterSpreader and/or TankSpreader during use. 2.Prevent ground wire from contacting with flammable liquid, electrical wires or equipment. Reel ground wire in, when possible. 4. Prevent unauthorized people from entering the work area. When using a flammable liquid with the Better Spreader, care should be taken to avoid creating a spark. Electric drills should not be used with flammable liquids as the motor may generate a spark. If using a flammable liquid utilize a non-sparking Beryllium/Copper Scratch Awl to open the holes in the pail.